Birgitta Sacrédeus, Chair of the CoR Interregional Group on Health & Wellbeing, welcomed participants to the second meeting of the year and informed attendees about the logistical arrangements. The agenda of the meeting was adopted as proposed. Federico Paoli presented the report ‘Tools and Methodologies to Assess Integrated Care in Europe’ produced by the EU Expert Group on Health Systems Performance Assessment (HSPA). The mission of the Expert Group, set up in 2014, is to provide Member States with a forum for exchange of experience on the use of HSPA at national level. The group also supports national policy-makers by identifying tools and methodologies for developing HSPA, defining criteria and procedures for selecting priority areas for HSPA at national and EU levels, as well as intensifying EU cooperation with international organisations, in particular the OECD and WHO. The Expert Group has four strands of activity: 1) Annual work on priority areas, 2) Sharing of national experiences, 3) Tailored country-specific activities, and 4) HSPA advocacy. Tailored country specific activities were introduced last year as a means for countries to discuss specific topics in more detail in collaboration with the group. The first such meeting took place in Rome on integrated care, the second meeting in Ljubljana focused on integrated care monitoring and the third meeting in Budapest looked into the assessment report. Concluding the yearly work, the Expert Group publishes a report of the main findings. Last year’s report on Integrated Care was built around three main chapters: definitions; design principles; and measuring the performance of integrated care. The conclusions were divided in three clusters 1) Quality assessment is a piece of a bigger puzzle, 2) Choice of indicators and concerns about data quality, and 3) Communication and follow-up of results. The report also contains over 60 case studies, almost all regional and local. The case studies include a detailed description of the interventions, target groups, success factors and transferable elements. To conclude, Federico Paoli emphasized that Integrated care is not a goal in itself but rather a tool to address complex care needs. He also pointed out that measuring the level of integration of care is different from measuring the performance of integrated care. To conclude, he stressed that integrated care is context specific and that there is no single ‘right’ approach that would be applicable and valid for every system. Andrea Pavlickova, NHS 24 Scotland (UK), presented the SCIROCCO tool designed to assess the readiness for integrated care in a given health system or practice. She started by pointing out that there is a variety of definitions of integrated care and that it is being adopted at different rates and in diverse ways across Europe. The rationale behind the development of the tool was to maximise the use of existing knowledge of implementing integrated care solutions and to encourage exchange of good practices and knowledge transfer in Europe, to be able to use evidence in a systemic way for an easier and faster adaptation. The work on the tool started within the European Innovation Partnership on Active and Healthy Ageing (EIP AHA), and started by the conduct of an observational study, interviewing representatives from 12 European regions, looking at their activities and ambitions. The interviews identified 12 dimensions of integrated care, common principles of broad agreement. These domains are also reflected as building blocks defined by the HSPA group. Subsequently, an assessment scale ranging from 0-5, measuring the maturity of each of these dimensions was developed. The conceptual version of the model was further transferred into an online self-assessment tool. She further invited everyone who is interested to test out the tool which can be easily accessed online. The 12 questions online questionnaire assesses 12 dimensions and produces visual outcomes – a spider diagram. Ms Pavlickova pointed out that the purpose of the assessment is not to benchmark and compare but to evaluate oneself and facilitate the identification of strengths and weaknesses. The tool can be used to assess either the health system at large or the maturity requirements of a specific practice. The tool helps to understand the environment in which a good practice has emerged, helps to identify the strengths and weaknesses, points out issues for knowledge transfer and scale up. The SCIROCCO tool is useful to assess health care at system level and orientate the discussion. The tool helps to detect gaps in the system and allows to dig deeper into specific areas. Further, the results of self-assessment from various regions can facilitate twinning and coaching. It allows to compare and contrast strengths and weaknesses of several regions, facilitates finding of information to improve a particular area in the system. However, the overarching objective is to facilitate knowledge transfer and scaling-up. One of the critical aspects is to identify the right person to perform the assessment. Ideally, the assessment should be carried out by the multidisciplinary teams, since this is required by the broad definition of the integrated care. It is important to include multiple stakeholders because they may have different perceptions of the current level of integration. The tool can also help facilitating a discussion/negotiation on defining of the common vision. Thus far, over 20 partners have applied the tool, including several EUREGHA members. Regarding the achievements, Andrea mentioned great response rates from regions, links with several EU level initiatives such as EIP on AHA, SCIROCCO, WHO, Digital Innovation for an ageing society, etc. Gunilla Carlsson, Lund University (Region Skåne, SE) introduced an explorative study of patient processes in “Hälsostaden, Ängelholm – boundless health care”, an integrated care project implemented at the Ängelholm hospital which started in October 2013 and will last until June 2018. Up to now, the future of the project and whether it will be integrated in the ordinary system is still uncertain. The project consists of a collaboration between the hospital, primary care, and the Ängelholm municipality. The aims of the project were to increase accessibility, provide health care at the right level and increase the patient flow between the hospital, primary care and the municipality. As part of the project, new teams were set up to coordinate care – including a mobile emergency team and local health care teams. The aim of the study, Patient processes for older people with multimorbidity, Experiences from the project “Hälsostaden, Ängelholm – boundless health care” ( in Swedish, English summary p. 6-8), was to explore the experiences of patient processes among older patients with multimorbidity as well as their family members, health care staff and management staff. For their study, the project team selected 12 patients for interviews. In total, 52 interviews were carried out. In general, the mobile emergency teams and local healthcare teams were experienced as supportive to patients. Some of the most important aspects resulting from the interviews were the needs of: 1) Continuity – there is a need to bridge differences in management structures between and within the organisations who work together, some of these challenges needs to be dealt with at the educational level; 2) Participation – the patients want communication and not just information; and 3) Geriatric competence about multimorbidity and the interactions among medical, psychological and social factors. Some of the main challenges to achieve integrated care were identified at the Swedish national level in 2017, specifically pointing at: lack of knowledge about what coordination really is and how to improve it; improving the use of care plans as a working document; lack of IT-support and legislative limitations; difficulties in developing agreements between municipalities and regions which have effects on patients; and the fact that the financial system does not incentivise coordination. Hälsostaden is trying to find new ways to solve some of the identified problems of fragmented health care through clinical and professional integration. A facilitating factor was that the impetus for change came from the organisation itself. Moreover, working in a project makes decision-making and change processes easier. To conclude, Gunilla Carlsson pointed out that as a result of involving many members of staff in patient’s care, patient processes are complex and it becomes difficult to empower patients. Hälsostaden Ängelholm is trying to find new ways to solve some of the identified problems of fragmented health care by clinical and professional integration. The Chair thanked the speakers, participants and the Committee of the Regions for hosting the meeting. 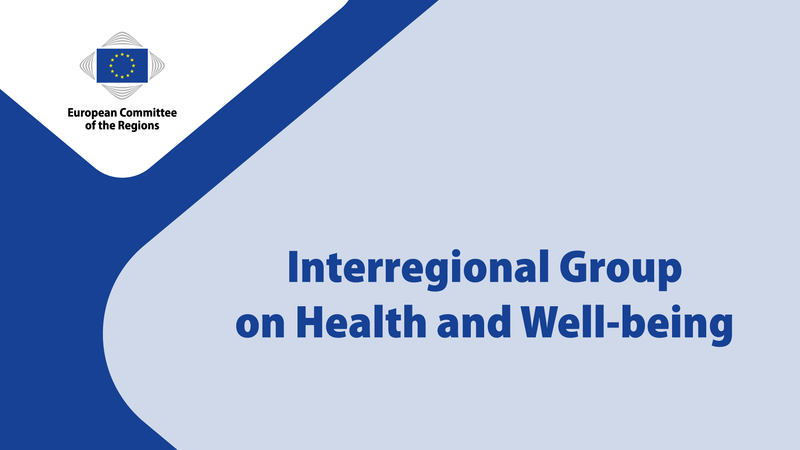 The next meeting of the CoR Interregional Group on Health & Wellbeing will take place during the European Week of Regions and Cities in October on the topic “Mental Health in the Workplace”. Further information about this meeting will be circulated during the summer.